WDX specialises in providing client lifecycle management and business intelligence solutions for the wealth and investment management market and offers consulting services and products based on the Microsoft Dynamics platform. WDX’s solutions are designed to address the industry challenges around conduct risk and increased demand for levels of relationship management, mobile and digital capabilities. Find new clients through social discovery, lead scoring, web tracking and create customised marketing strategies to prospective and existing clients, partners, and intermediaries. Streamline complex private client and entity onboarding workflows including KYC, AML, risk profiling and suitability and enable clients and intermediaries to self-serve whilst meeting regulatory obligations. Reduce risk and improve efficiency with the WDX client management module that has been built to provide a single, modern, dashboard based view for all historical and planned client communications and activities, all recorded client data including KYC and Suitability information and client documentation. Present actionable intelligence and determine next best actions for clients. Empower wealth managers and private bankers by supplying them with key information and reports on client activity to drive new business whilst taking care of existing clients. Address industry challenges around conduct risk and stay competitive and compliant by tracking and monitoring activities, demonstrating suitability, and providing evidence to the regulator. WDX specialises in providing client lifecycle management and business intelligence solutions based on the Microsoft Dynamics platform. The WDX ONE client lifecycle management platform provides five key pillars of technology that are vital to support wealth and investment managers in the modern era. Built around a central pillar of CRM, WDX ONE enables firms to put the clients’ interests first, ensuring that they receive a thorough and more personal service in line with a firm’s best practices. Within the Private Client and Investment Management community there are a number of organisations offering clients differing types of services. WDX has experience in delivering solutions to a number of sectors where the organisation may be servicing institutional investors, charities, intermediaries, families or individuals. Quick delivery = Lower project cost. Operational efficiencies, cost savings and other benefits realised earlier. A robust product set that only requires configuration and specific customisations as needed. Pre-built interfaces significantly accelerates project delivery timeframes. A 100% focused industry specialist with a proven and constantly evolving “solution” will lower project risk. Microsoft Dynamics UK CRM Gold Partner. An evolving product that adapts to industry changes. Thousands of days development and millions of pounds of investment in WDX every year. Support from Microsoft in the use of cutting edge technologies to strengthen the evolving nature of the business. 10 years delivering 50+ Dynamics CRM projects to Wealth Managers. Dedicated team that have been involved in the industry’s most successful projects. WDX has 100% delivery record. Proven project methodology that delivers results quickly. Experienced consultants and partner network who know how to get users to adopt new systems. WDX has many partnerships with other leading technology providers, back office systems, and consultancy and research specialists to offer a dynamic, innovative and integrated solution. If you would like to work with us then you can get in touch with us on our Partners page. We are delighted that Schroders have joined the WDX client portfolio. 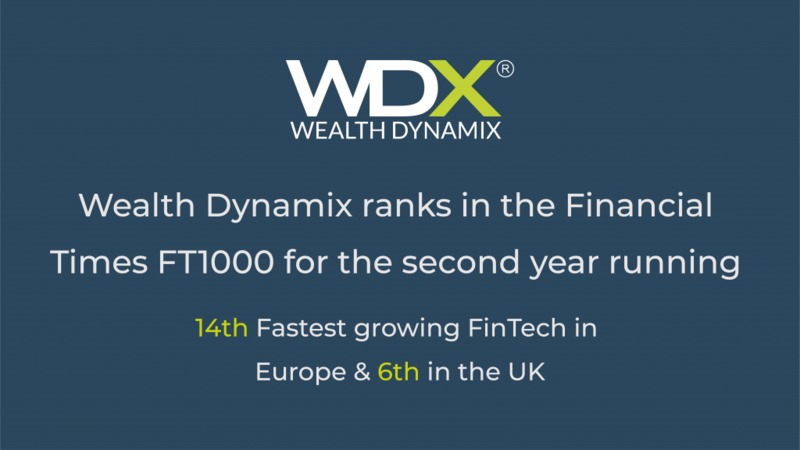 Wealth Dynamix today announced its ranking in the Financial Times FT1000 for two years running. The UK headquartered firm has ranked 14th fastest growing fintech in Europe and 6th in the UK, with revenue growth of over 300%.